Showing results for tags '!!!'. I know, it's not Wednesday... Hey everyone! I mentioned recently that the "Weekly Updates" may be switching days - I expected the news to start getting busy, and that is now official! I haven’t picked a specific day yet, and I may not need to. The weekly updates won't be necessary once we have an RV, and the stars are lining up very nicely right now. Fingers crossed on that one. I’ll explain why below, and you might want to strap in for this one! First, the budget was submitted, signed, and looks like it will be passed, with a HUGE keynote - a significantly acceptable portion of the budget going to the Kurds. This has been a major point of contention between the parties over the years, in fact it’s possibly the biggest point of disagreement and reason for delays in the budget approval process in recent history. You can read the budget as it is written and posted here, but it needs to be published in the Gazette to be official. This may be happening yet this week, and if it does... that will be insanely quick. It's barely the first week of February!!! Last year the Budget was boycotted by the Kurds in March, and they threatened to secede over the disputes. THAT is how far we've come in a year!!! If you’re not already squirming, let me tell you - this is awesome news. A happy GOI is a GOI that we can get behind, because it’s one that is more likely to RV. And this is possibly the happiest we’ve ever seen them! That by itself may have been enough reason for me to send out a special email on most weeks, but this week - THIS week - we have more. Maybe MUCH more! I’m trying to contain my excitement, and I’ve been doing a pretty good job of staying (mostly) in my seat, but it’s getting more and more difficult. We may have an HCL agreement shortly! I’ve been on the verge of releasing this information for over a week, and I’ve only held off because THIS is the kind of movement we need to see for an RV to happen, and I didn’t want to release the news without a full confirmation. As the news keeps coming out, this is going to start getting press in other places, so you may as well hear it here. If you’ve been following me for any time now, you know I’ve been on an “HCL-requirement” kick for a couple years now. No HCL = no RV. I've harped on that for years... and now, after a long ride, it's not just on the horizon - it's coming at us, lights flashing and horns blaring! If you have NOT been with me for that long, let me introduce myself! Hi, I’m Adam Montana. The possibility of a Dinar RV has been in the works for a while now - over a decade, in fact. I’ve been following it, and helping tens of thousands of people avoid bad info, for the entire time. The summary on Iraqi Dinar is simple - back in 2003, the country of Iraq went through some stuff and their currency plummeted in value. It was once worth over $3 per one Iraqi Dinar, and now it’s worse than 1000 dinars to $1. It was even worse, so much worse that those of us who got in early enough have already doubled our money. But, and this is why most of us are here in the first place, it stands a fighting chance of going back to it’s former value, or “ReValuing”, upwards to the tune of 100x where it is now or even more. When that happens, those of us who have the current Iraqi Dinar (not the “old notes” with Saddam Hussein’s face on them) will be able to exchange at that higher value, winning us an amazing profit. It’s called a “windfall”, and it’s definitely a real thing. Here’s where yours truly comes in. 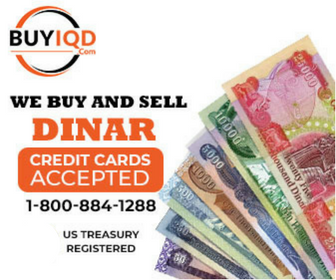 Throughout this whole venture, and before most of us ever heard of the Iraqi Dinar, I’ve been fortunate enough to have contacts in places that matter to get the absolute best return on the exchange. Because of the loyal group of members here at dinarvets who have committed to work alongside my partners and I in this, we have formed the STRONGEST and BEST CONNECTED group of dinar holders in the world… and this gives us EVEN MORE leverage. It's a snowball effect, and it's a good place to be. In short, we’re going to put more money in our pocket than the average Joe or Mary that simply goes to the bank to cash in. Not only that, but the years of networking and planning for this event have allowed my contacts and I to put together the absolute best strategies for reducing tax liabilities, minimize risk, and even invest after the fact to increase our returns. The best part? There will be no “800 numbers” to call. The VIP group will NEVER part with their dinar as part of their exchange. And if you decide to pay the measly amount of money it costs to join the VIP group, you are ABSOLUTELY GUARANTEED to get a return on that expense when we cash in on the RV, or I’ll refund every penny you spent on VIP. Your time may be running out. Join VIP here, before it's too late. Back to the Dinar, for the past couple years I’ve been saying that we need to see progress on the HCL to see the RV. While other websites and “gurus” are talking about people already cashing in (fake news), or having “secret intel” on the timing of this event… I’ve been telling people to remain calm. That’s one of the reasons thousands of VIP members place their trust in my and the programs here, because I don’t fluff this stuff up just to get people excited. I do the opposite - if there’s nothing going on, I tell it like it is, no matter who gets mad at me for it. (It happens! ) Well… the time that we have been waiting on may be over. There is news out right now that is more encouraging regarding the HCL than ANYthing I have ever seen, and that means we’re almost there. It means this may be your last chance to get in VIP. Your chance to get in VIP may be over before I get this email sent out! And if the RV is announced, and you’re not in the VIP group - you’re on your own. No benefits, no tax benefits, and good luck to you. Now is probably the most URGENT time in this venture to get in VIP. Join here: https://dinarvets.com/forums/index.php?/store/category/1-vip-membership-packages/ Remember, there’s a money back guarantee. You have nothing to lose and a LOT to gain. See you in there! GOOOOO RRRRVVVVVV!!!!!!! - Adam Montana P.S. In reading the above, I see that I didn't explain why the HCL is important. In a nutshell, it's important to the Kurds so they get a fair share of oil revenue, and ties in very closely to their concerns on the budget. Both of those issues are melting away, right in front of our eyes. With these two things lining up at the same time, we have the most perfect situation to see an RV that I've ever witnessed. RIGHT NOW is an amazing time to be part of this situation!